These finds were published in Yael Israeli and Natalya Katsnelson, “Refuse of a Glass Workshop of the Second Temple Period from Area J,” in Jewish Quarter Excavations in the Old City of Jerusalem, Conducted by Nahman Avigad, 1969–1982, v. 3, Area E and Other Studies: Final Report, ed. Hillel Geva, Jerusalem: Israel Exploration Society and Institute of Archaeology, Hebrew University of Jerusalem, 2006, pp. 411–460. Friederike Naumann-Steckner, “Depictions of Glass in Roman Wall Paintings,” in Roman Glass: Two Centuries of Art and Invention, ed. Martine Newby and Kenneth Painter, London: Society of Antiquaries of London, 1991, pp. 86–98. See Hugh Tait, “Venice: Heir to the Glassmakers of Islam or of Byzantium?,” in Islam and the Italian Renaissance, ed. Charles Burnett and Anna Contadini, Warburg Institute Colloquia, v. 5, London: The Warburg Institute, University of London, 1999, pp. 77–104; and William Gudenrath, “Enameled Glass Vessels, 1425 B.C.E.–1800: The Decorating Process,” Journal of Glass Studies, v. 48, 2006, pp. 23–70. Hugh Tait, “The Palmer Cup and Related Glasses Exported to Europe in the Middle Ages,” in Gilded and Enamelled Glass from the Middle East, ed. Rachel Ward, London: The British Museum, 1998, pp. 50–55. 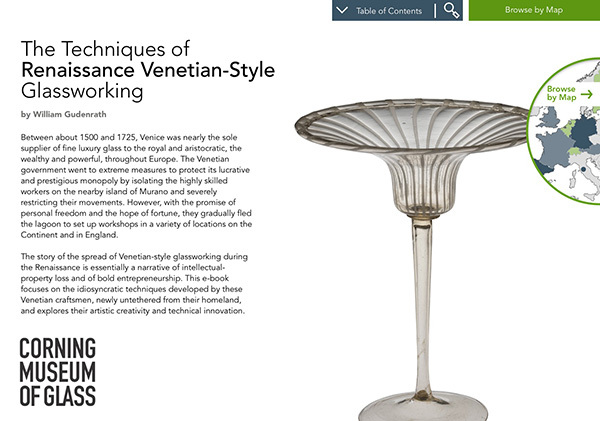 See The Aldrevandin Group in A Historical Overview of Glassblowing in Venice. See Altino: Glass of the Venetian Lagoon, ed. Rosa Barovier Mentasti and Margherita Tirelli, Treviso, Italy: Vianello, 2010. For more on Torcello and its glassmaking industry, see Lech Leciejewicz, “How to Date the Glass-Making Workshop in Torcello?,” Archaeologia Polona: Journal of Archaeology, v. 45, 2007, pp. 99–104, online at www.iaepan.edu.pl/archaeologia-polona/article/717 (accessed July 24, 2015). For a more complete study of enameling (and gilding) on glass vessels, see William Gudenrath, “Enameled Glass Vessels, 1425 B.C.E.–1800: The Decorating Process,” Journal of Glass Studies, v. 48, 2006, pp. 23–70. Works from Venetian glasshouses that were displayed at the Paris world’s fair of 1867 are shown in The Illustrated Catalogue of the Universal Exhibition, published with the Art Journal, London and New York: Virtue , pp. 33 (Salviati display), 101 (Salviati chandelier), and 105–107 (Italian glass). The Corning Museum of Glass collection includes a goblet made in Venice in the mid-1860s (79.3.1115). For more information, see Helmut Ricke and Eva Schmitt, Italian Glass: Murano, Milan, 1930–1970. The Collection of the Steinberg Foundation, New York: Prestel, 1997. Mary P. Merrifield, Original Treatises on the Arts of Painting, v. 2, New York: Dover Publications, 1967, pp. 526 and 528. Also cited in Tait [Note 1], p. 26. See Gudenrath [Note 13], pp. 50–58. See The Material: Making Glass in Renaissance Venice. For a complete study of Venetian glassmaking developments from the Middle Ages through the Renaissance, see M. Verità, “L’invenzione del cristallo muranese: Una verifica analitica della fonti storiche,” Rivista della Stazione Sperimentale del Vetro, v. 15, no. 1, January/February 1985, pp. 17–29. For a more recent discussion of the same subject in English, see Koen Janssens, ed., Modern Methods for Analysing Archaeological and Historical Glass, 2 vv., Chichester, West Sussex, U.K.: John Wiley & Sons, 2013.